The Continental Army was formed after the outbreak of the American Revolutionary War by the colonies that became the United States of America. Established by a resolution of the Continental Congress on June 14, 1775, it was created to coordinate the military efforts of the Thirteen Colonies in their revolt against the rule of Great Britain. The Continental Army was supplemented by local militias and other troops that remained under control of the individual states. 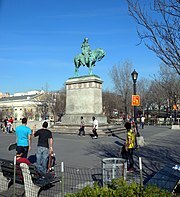 General George Washington was the commander-in-chief of the army throughout the war. The Continental Army consisted of soldiers from all 13 colonies, and after 1776, from all 13 states. When the American Revolutionary War began at the Battles of Lexington and Concord in April 1775, the colonial revolutionaries did not have an army. Previously, each colony had relied upon the militia, made up of part-time citizen-soldiers, for local defense, or the raising of temporary "provincial regiments" during specific crises such as the French and Indian War. As tensions with Great Britain increased in the years leading up to the war, colonists began to reform their militia in preparation for the potential conflict. Training of militiamen increased after the passage of the Intolerable Acts in 1774. Colonists such as Richard Henry Lee proposed creating a national militia force, but the First Continental Congress rejected the idea. On April 23, 1775, the Massachusetts Provincial Congress authorized the raising of a colonial army consisting of 26 company regiments, followed shortly by similar but smaller forces raised by New Hampshire, Rhode Island, and Connecticut. On June 14, 1775, the Second Continental Congress decided to proceed with the establishment of a Continental Army for purposes of common defense, adopting the forces already in place outside Boston (22,000 troops) and New York (5,000). It also raised the first ten companies of Continental troops on a one-year enlistment, riflemen from Pennsylvania, Maryland, Delaware and Virginia to be used as light infantry, who later became the 1st Continental Regiment in 1776. On June 15, the Congress elected George Washington as Commander-in-Chief by unanimous vote. He accepted and served throughout the war without any compensation except for reimbursement of expenses. Four major-generals (Artemas Ward, Charles Lee, Philip Schuyler, and Israel Putnam) and eight brigadier-generals (Seth Pomeroy, Richard Montgomery, David Wooster, William Heath, Joseph Spencer, John Thomas, John Sullivan, and Nathanael Greene) were appointed in the course of a few days. Pomeroy declined and the position was left unfilled. As the Continental Congress increasingly adopted the responsibilities and posture of a legislature for a sovereign state, the role of the Continental Army was the subject of considerable debate. There was a general aversion to maintaining a standing army among the Americans; but, on the other hand, the requirements of the war against the British required the discipline and organization of a modern military. As a result, the army went through several distinct phases, characterized by official dissolution and reorganization of units. 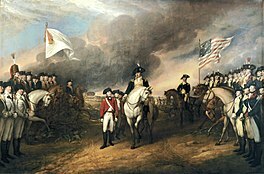 The Continental Army of 1777-80 was a result of several critical reforms and political decisions that came about when it was apparent that the British were sending massive forces to put an end to the American Revolution. 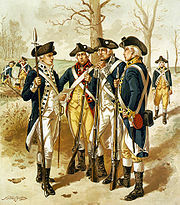 The Continental Congress passed the "Eighty-eight Battalion Resolve", ordering each state to contribute one-battalion regiments in proportion to their population, and Washington was subsequently given authority to raise an additional 16 battalions. Also, enlistment terms were extended to three years or "the length of the war" to avoid the year-end crises that depleted forces (including the notable near collapse of the army at the end of 1776 which could have ended the war in a Continental, or American, loss by forfeit). The Continental Army of 1781-82 saw the greatest crisis on the American side in the war. Congress was bankrupt, making it very difficult to replenish the soldiers whose three-year terms had expired. Popular support for the war was at its all-time low, and Washington had to put down mutinies both in the Pennsylvania Line and New Jersey Line. Congress voted to cut funding for the Army, but Washington managed nevertheless to secure important strategic victories. The Continental Army of 1783-84, was succeeded by the United States Army, which persists to this day. As peace was closed with the British, most of the regiments were disbanded in an orderly fashion, though several had already been diminished. The financial responsibility for providing pay, food, shelter, clothing, arms, and other equipment to specific units was assigned to states as part of the establishment of these units. States differed in how well they lived up these obligations. There were constant funding issues and morale problems as the war continued. This led to the army offering low pay, often rotten food, hard work, cold, heat, poor clothing and shelter, harsh discipline, and a high chance of becoming a casualty. Nevertheless Steuben's Blue Book remained the official manual for the legion, as well as for the militia of most states, until Winfield Scott in 1835 adapted the 1791 French Army Regulations for American use. The integration of ex-Continentals into the militia, coupled with the passage in 1792 of a national militia bill, and the establishment of the first basic training center at Legionville, all helped to improve the military of the United States. In 1796, the United States Army was raised following the discontinuation with the legion of the United States. This coincided with the graduation of the first cadets from United States Military Academy at West Point, New York, which had been established in 1794. Risch, Erna (1981). Supplying Washington's Army. Washington, D.C.: United States Army Center of Military History. http://www.history.army.mil/books/RevWar/risch/risch-fm.htm. Wright, Jr., Robert K.; MacGregor Jr., Morris J.. "Resolutions of the Continental Congress Adopting the Continental Army and other Sources from the Revolution". Soldier-Statesmen of the Constitution. Washington D.C: United States Army Center of Military History. CMH Pub 71-25. http://www.history.army.mil/books/RevWar/ss/revdoc.htm#rev1.